There are many Law of Attraction myths that can be quite overwhelming. Sometimes these myths are so disheartening they make the Law of Attraction seem impossible. 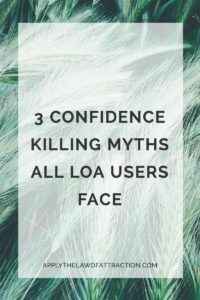 Here are three confidence killing myths all Law of Attraction users face. Don't let them sabotage your success! …but the Law of Attraction doesn't care! From a Law of Attraction point of view, they are ALL the same. The Law of Attraction doesn't care if you're trying to meet someone you've never met or get back together with your ex after having broken up for the third time. The Law of Attraction doesn't care if you haven't spoken to your daughter for 5 years or if you're a day away from eviction. The Law of Attraction is applied the exact same way in every situation for EVERYTHING. You still have to get clear on what you want and ask for it. You still have to pay attention to your thoughts, feelings, and every other aspect of your vibrational alignment. You still have to allow yourself to receive your desire. I wish I could tell you that there is a special technique that applies to your situation. I wish I could wave a magic wand and make something appear that was just for you. All you need to know are the basic rules of the Law of Attraction. Once you know them, you can change your situation to match what you want. Clear any limiting beliefs or resistance that comes up along the way. The Law of Attraction is suprisingly simple – stupidly simple. You want it to be more complex than it is. You think there's some kind of mystery to it that once you solve it, everything will fall into place; your life will fall into place. I hate to break it to you, but the Law of Attraction is always working. ALWAYS! It has been working your entire life. The only difference is you're now aware of it. It isn't a matter of knowing whether the techniques are working or knowing if you are doing it right. If you aren't sure, you're not manifesting what you want. Plain and simple! If you aren't sure, you're experiencing doubt, resistance, fear, impatience, and other lower vibrational thoughts and emotions. You are creating, but not what you want. You're actually pushing what you want to create away from you. You need to trust that the Law of Attraction is working. You need to let go of all attachment to the outcome. You need to live from the end result as if you already have manifested your dream. Before you know it, you will be using the Law of Attraction to create what you want. Wouldn't it be nice if you could rub a magic lamp and have a genie appear who would grant all of your wishes while you just sat around eating bonbons and watching TV? There's a reason that's a fairytale. So too is the idea that you don't have to do anything for your goal to manifest. The Universe wants to give you exactly what you want, but you have to be willing to do your part. When you take action, you tell the Universe that you are committed and willing to do what it takes. But you don't want to take just any action. You want to take inspired action. Inspired action is the intuitive nudge from the Universe about what actions to take that will lead you closer to your dream. It might be calling someone, taking a different direction home from work, or filling out a form. It often comes out of the blue, but be sure to follow it when it shows up. Have you fallen for any of these Law of Attraction myths? Don't start beating yourself up if you have fallen for any of these Law of Attraction myths! That will only lower your vibration. Instead, acknowledge it and move on. Once you're aware of these Law of Attraction myths, they have no power over you. Awesome information on myths about the law of attraction! Thanks! Thank you! Just now came out of all three myths. God bless!